My grandmother, a woman named Minnie Fargier, was born in a dugout on the Rolling Plains in 1893. She lost her father when she was about seven because of the lack of any medical care. She married at 16 and bore five children, including my mother, and lost one child to an early death. She lived in the same small frame wooden farmhouse in an isolated rural area on the plains until the final years of her life. Minnie had few "modern conveniences" before the 1940's. I remember, during the late 1930's, that she drew her water from a cistern. My grandmother lit her home with kerosene lanterns and heated it with a cast iron, wood-burning stove. She made lye soap and washed her clothes in a great iron kettle. She and the family used an outhouse. Minnie cooked three meals a day on that same stove, for her family and the day worker cowhands. Working beside my grandfather, she tilled the fields with mule-drawn plows. She hauled newly harvested cotton in mule-drawn wagons. After my grandfather died in 1954, she ran her 1000-acre farm with 100 head of cattle until she reached her late 80s. She got bitten by a rattlesnake, which had crawled into her living room, when she was 90, and she fetched a butcher knife and separated the rattler from its head before she called for help. She rode horses until her early 90s. As a young woman, she had gotten herself "churched," that is, expelled, by her Protestant congregation for dancing. The devil was in the fiddle. I loved my grandmother very much. Many young women who later became pioneers began life in a relatively sheltered environment, living with their parents and several brothers and sisters in a rural hamlet, where they occupied a small wooden frame or brick house with a cistern, an outhouse, candle light, cast iron cooking and heating stoves, glass windows and plank floors. Most had never traveled more than a few dozen miles from their homes. Women could expect their lives to revolve around marital submissiveness, a clean house, well-tended children, a productive garden, thrift, modesty and stern Protestant valueswhat Barbara Welter called the “Cult of True Womanhood” in American Quarterly. And then they may have gotten married, probably in their mid- to late teens. Three years and two babies later, they might discover that their hard working and moderately successful husband had heard the siren call of the West, with its fields of gold and silver, its acres of free and bountiful land, its tantalizing promise of prosperity, its summons to adventure. He found the lure of the West irresistible. They must, he said, go West, where he could fulfill his dreams for her, their children, himself. In the February 1, 1847, entry in her diary, Down the Santa Fe Trail and Into Mexico, 18-year-old new bride Susan Shelby Magoffin spoke of the hardship of the trail: "We are almost at the mouth of the Jornada (the long journey without water) [a passage on a desert trail through New Mexico] have been traveling slowly the roads being exceedingly heavy, with two or three severe hills; one we passed this morning, about a half mile in length, and the sand so heavy all the teams doubled and were then just able to get over with resting half a dozen times... ...the poor animals work so hard." "A great many [people], when their teams began to fail, left their wagons and packed what they could..."
In one stretch of 16 miles, said Strentzel, "I counted 27 dead animals immediately by the road, besides those that wandered off in search of water and died." In a quote published by Linda Peavy and Ursula Smith in their Pioneer Women: The Lives of Women on the Frontier, 18-year-old Esther Hanna, a minister's wife, said, "It is very trying on the patience to cook and bake on a little green wood fire with the smoke blowing in your eyes so as to blind you..."
When they reached the desert in their journey west, the pioneer women, with larders beginning to run low, discovered that prickly pear cactus pads, rich in vitamin C, could be incorporated into their family diets, according to Peavy and Smith. They boiled the pads and the red fruit, making it easier to remove the spines and the skins. The pad fibers, served fried, tasted something like green beans. The fruit fiber, served raw, tasted like a mix of watermelon and cucumbers. In addition to the hardships of the trail, pioneer women often had to endure a humiliating lack of privacy. Between campsites, they sometimes used their long skirts to shield a companion from inquiring male eyes. In camps, they sometimes turned to flimsy canvas latrines. At the occasional watering holes, available to men as well as women, they had to wash rags that had served as sanitary napkins. As caravans rolled westward through the desolate desert landscape, water was limited and rationed. First it had to answer the thirst of the pioneers and their livestock. Then, should there be a spare tubful, a woman might make it serve multiple purposes — washing dishes, washing clothes and bathing children in the same water. With poor sanitation and the punishing environment taking an inevitable toll on the health of the travelers, women often became the principal caregivers, treating the sick, setting broken bones, amputating limbs, delivering babies. Knowing the risks of cholera, typhoid, smallpox, pneumonia and other diseases, they came as prepared as they could. One pioneer woman, according to Peavy and Smith, said, "no one should travel this road without medicine, for they are sure to have the summer complaint. Each family should have a box of physicking pills, a quart of castor oil, a quart of the best rum, and a large vial of peppermint essence." When the women got sick, they often treated themselves. "...I had an ugly cold...which required two or three nights' sweating, and onion poltice before I found relief," said Susan Magoffin. Even if they never experienced actual Indian "depredations," the women felt constantly haunted by the shadows of Comanches, Kiowas, Apaches, Navajoes, Utes and other tribes. In El Paso, said Strentzel, "Mules and oxen were not to be had. The Indians [probably Mescalero Apaches] were constantly making incursions on the inhabitants and driving off their stock." In Santa Cruz, a village of some 300 in southern Arizona, residents were "unprotected and exposed to the mercy of the [Chiricahua or Western] Apache Indians who come in at times and drive off all their stock; kill and make them prisoners..." She knew that the same Apaches loomed as a threat over the wagon trains. Some women, distraught by the unremitting rigors of the trail, tried to turn back, according to Cathy Luchetti and Carol Olwell in their book, Women of the West. "There are accounts of women setting fire to their wagons, stealing horses and riding east, even threatening their own children" in a maddened effort to escape their ordeals. Others, thrilling to the adventure, "urged their husbands ever forward". When the young pioneer women, with their husbands and children drew near the end of the journey through the desert, they emerged forever from the sheltering cocoon of their childhood homes. A litany of hardships had hardened them. Perhaps a prematurely newborn infant had been left in a sheltering grove of oaks beside the trail, resting in a shallow grave, swaddled in a blanket, covered with river cobbles, and marked with a rude cross. The pioneers may have abandoned oxen, exhausted, to die beside the trail. Discouraged prospectors might have revealed that the fields of California yielded more disappointment than gold. The young women may have longed for the greenness of home, the richness of the fields, the rains of summer. Most of all, they probably yearned to be through with the damnable trail. At some point for each family, a choice was made to stop and build their new home. Desert grasslands, near a spring seep and drainage beside a small mountain range a few miles from neighbors on other lands, and from a budding hamlet of Mexican and Anglo people might have looked like a good choice. They would buy a few longhorn cows and start a frontier ranch. They would plant a garden. Perhaps they, with future neighbors, might someday build a church and a school. The husband would do a little prospecting. They might yet strike gold. Another chapter in pioneering history had begun: the isolated and self-sufficient lifestyle of the early American settlers. While the family lived in the shelter of the wagon, the husband and wife shoveled a small dugout into the side of a hill. With small timbers cut by hand ax from the flanks of the nearby mountains, they built low and windowless walls around the dugout perimeter. They topped the structure with a roof of logs, grass and mud. At first, they had to carry the family's water from the spring seep, storing it in the wooden barrels they had used on the trail. A cistern would have to come later. The family relieved themselves in a nearby growth of desert shrubs. An outhouse would have to come later. The darkness of the outhouse was lit only with candles the women made of tallow. Kerosene lanterns would have to come later. The wife bedded her family and stored her goods on the dirt floor of the outhouse. Beds, closets and shelving would have to come later. They all kept a close watch out for rattlesnakes, scorpions, tarantulas and centipedes. Those would always be there. The pioneer woman in her new home cooked in front of the dugout on an open fire, which sometimes seared the hems of her long dresses and blistered the bare skin of her arms and face. In the early days, before her husband could buy livestock or they could raise a garden, she had to prepare meals from what few vegetables she could buy in the local hamlet, the wild greens she could gather from the nearby drainage, and the game her husband could kill in a hunt. Buying or weaving her own cloth, she made her family's clothes, sewing the garments by hand. It came hard for many. One pioneer woman, quoted by Sandra L. Myres in her book Western Women and the Frontier Experience 1800-1915, said, "I never learned how to make dresses or to fit garments, and the result was something like a bag." Some learned, like Indian women, to tan hides of mule deer and fashion clothes of leather. The typical young pioneer woman washed her family's clothes in a wooden barrel using water she had carried from the spring and heated over the open fire. She used lye soap she had made from lime, ash and tallow. Within a year, another child was often born, with no anesthesia, but with a neighboring woman's help. Pioneer women usually found the event to be a difficult trial, accompanied not only by the pain of the delivery but also the risk of injury, infection and disease, both for her and the infant. "So here I was," said one Arizona frontier woman, according to Myres, "inexperienced and helpless, alone in bed, with an infant a few days old... I struggled along, fighting against odds." 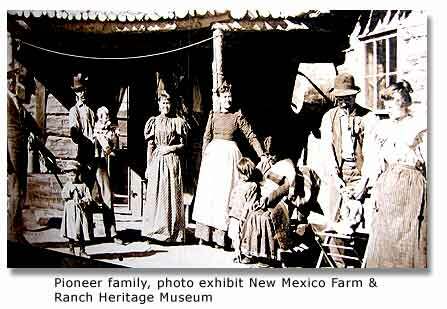 Pioneer woman found that their families, and sometimes their neighbors, looked to them for medical assistance. She saw one of every four newborns die of diseases or other causes. 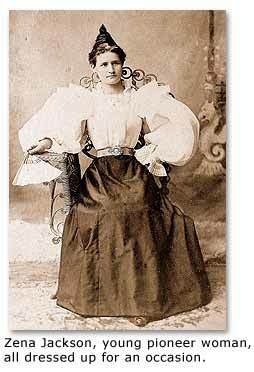 "My Babes all snatched from me one by one," said a pioneer woman quoted by Myres, "it is hard to bear." Pioneer woman turned to folk medicine, home remedies, love and prayer to heal family and neighbors. There were no doctors. Newly arrived mothers were advised to give their children something like a teaspoonful of Dr. Gunn's recipe of saffron, sage leaves, tanzy leaves and brandy a couple of times a month. The children, according to Helen Wiser Stewart (quoted by Luchetti and Olwell), "will never be troubled with worms as long as you do this." Though pioneer women lived in dread of sickness and injury, they may have feared Indians and vagrants even more, especially when their husbands had to leave them alone with the children. Alice J. Van Winkel, a desert pioneer interviewed during the Federal Writers' Project for American Life Histories, recalled that, "To my horror I saw five Indians all dressed up in their blankets and war paint, coming towards the house. I stepped out in the yard to meet them, for the children and I were all alone... ...one of the Indians said to me: 'Indians no hurt white squaw she give Indians something to eat.'" The Indians, probably Comanches or Mescalero Apaches, appropriated bread and half a mutton and left. "I did not say anything for I was only too glad to get rid of them." Recalling another instance, Van Winkel said, "One night while I was alone with my two children, I heard the dogs barking about midnight. I got up and got the six shooter and I looked out the window and could see three dark objects [apparently vagrants bent on robbery] prowling around the house." Van Winkel locked the door. They tried to break it down. "I told them that the first person that came through the door would certainly get shot." They left, but, she said, "I was very much frightened." As a ranch became established, demands on time and energies would double, then double again. Since supplies were bought perhaps only two or three times a year, a shopping list had to be planned with care. Typically, according to Ruth White Burns' "Experiences on the H-Bar Ranch," Roosevelt County History and Heritage, 1975, purchases might include: flour in wooden barrels, bacon slabs in wooden boxes, coffee by the case, dried fruit in wooden boxes, molasses by the keg, navy beans in 50-pound sacks. "Of course," said Burns, "such things as sugar, salt, soda, tobacco, matches were also brought by the wagons." The pioneer ranch woman also now had to cook for the cowhands as well as her family: bacon or beef, navy beans, sourdough biscuits, molasses, dried fruit and coffee—three times a day. In addition, wearing a bonnet, a long dress and high-top shoes, she tended the garden, raised hogs and chickens and canned fruit—all while she kept house, made and mended clothing, saw after her children, healed and comforted the sick and injured, and protected her home. Often, during the roundup season, she herded cattle, doctored sick animals and branded calves. As Olive Ozanne said in Robert L. Hart's "She'll Be Coming Around the Mountain," Southern New Mexico Historical Review, January 1996, I "found that my little white hands could do lots of things besides crochet and play the piano." In spite of the distances between neighbors, it was possible to make friends through the church and social events. "Quilting bees, barn raisings, even communal butcherings of livestock rose spontaneously from the neighborly desire to help out and see one another. Dances, too, were a reflection of this shared excitement, and were a favorite pastime of nearly all women," said Luchetti and Olwell. "Weddings were also grand affairs, with chivarees held afterwards that many a newlywed remembers for years to come. "But even without dances and weddings, some women managed to find occasions for joy in their lives... Such a woman was Frances Clack. 'She loved the outdoors,' wrote her daughter Tommie, ' and would tell us about trees, the flowers, the rocks, the birds and the animals that lived up and down the creek... At night she would take her astronomy book out into the moonlight and teach us to recognize Ursa Minor and Ursa Major, and how to locate the North Star.'" While a pioneer woman certainly followed her husband on the difficult journey westward through a sense of duty to him and to her family, many would discover a larger role in life, a new sense of identity and self-worth that became an unexpected dividend of independence and freedom. One immigrant, quoted by Susan G. Butruille in her Women's Voices from the Western Frontier, said that, when she grew up, "...my folks wouldn't let me go to dances. They held that the devil was in the fiddle and that if a girl danced, she was dancing her way to hell." Once they came West, many women danced. They took their places, not only as the heads of their households, but as owners and managers of ranches, operators of mines, proprietors of businesses, teachers in one-room schoolhouses, performers on the stages, madams of bawdy houses, and stakeholders at the gaming tables. They gave new dimension to the meaning of what it could mean to be a woman. An immigrant woman quoted by Butruille said, "At last I understand why the birds sing. ...The real life is to be free." 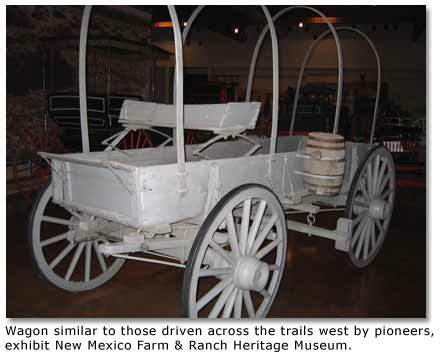 My thanks to Claire Odenheim and Ralph Wilcox, New Mexico Farm & Ranch Heritage Museum library for their help in locating source material for this article.